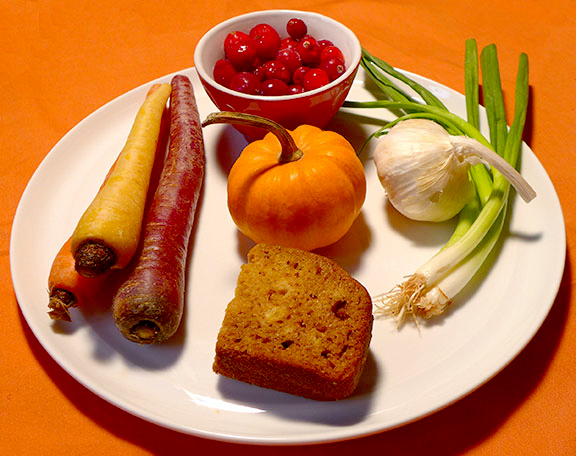 Are we ready for a Thanksgiving Seder plate? As I continue to work on my Passover cookbook, I am struck by certain parallels between Passover and Thanksgiving. Just as Thanksgiving is the most popular holiday enjoyed in the United States by Americans of all backgrounds (a billion-dollar industry with thousands of cookbooks around one food holiday alone! ), Passover is the most loved of all holidays in the Jewish calendar celebrated by Jews from all streams of Judaism. Like Thanksgiving, Passover takes place with family and friends of all generations sitting around a big table (or two) at home, outside of any house of worship. For Thanksgiving, turkey, cranberry sauce, stuffing, and sweet potatoes have become the symbols of the holiday, while matzah, charoset, gefilte fish, chicken soup (with matzah balls), eggs, and either brisket or lamb have become synonymous with Passover here in the United States. Some individuals and Jewish organizations have even taken up this opportunity to take aspects of the Passover Seder and weave them into their Thanksgiving meals. During these meals, mini Haggadot or prayer booklets are distributed at the table to discuss the topics of “Struggle, Freedom, and Gratitude” as a universal concept. QUESTION: What would you put on your Thanksgiving Seder plate?